CeBit - BITS 2015 - Yusata Infotech Pvt. Ltd.
We organized an Awareness Seminar on Navratri- A festival of Woman Empowerment at Malviya College for Girls, Malviya Nagar, Jaipur in association with HELP Foundation. Our Chief Guest Ms. Sheela Fogavat Dy. 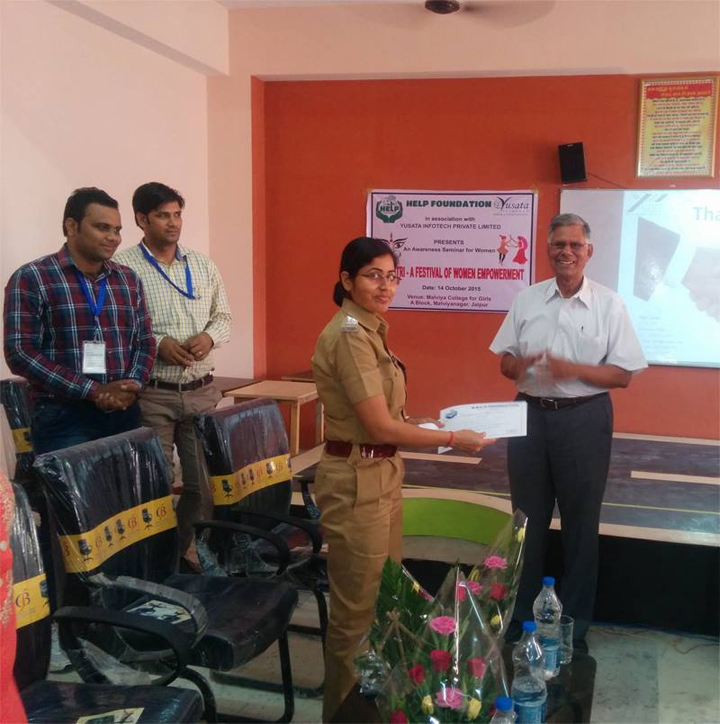 SP Women Section, Rajasthan Police encouraged girls and women from community to know their Judical powers and use technology for their safety. It was a proud moment when she recommended our app YLogSecure and talked about it to the audience. A presentation on YLogSecure was made with all the details. We distributed free coupons to download the app and use for one year. We would like to thank our delegates for making their presence at HELP Foundation - Jaipur 2015.